Thomas Mifflin (1744-1800) and his wife, Sarah Morris Mifflin (1747?-1790), were the only Philadelphians painted by John Singleton Copley, the greatest artist in the American colonies prior to the Revolution. Mifflin was an ardent patriot and by the time this portrait was made, had established himself as a successful merchant; later he rose to the rank of major general in the Continental Army, and was elected the first governor of Pennsylvania after the United States achieved independence. Sarah Morris, who married Thomas in 1767, was an accomplished, witty, and supportive partner. 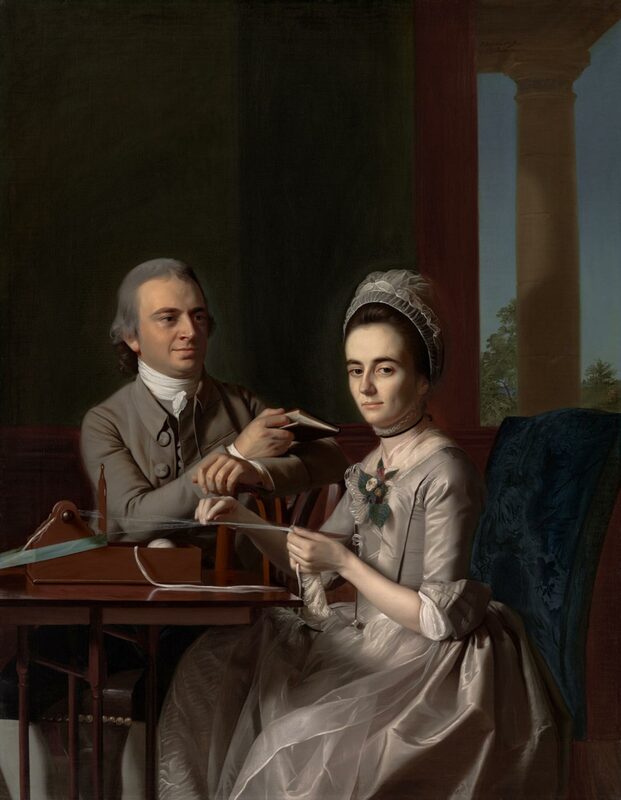 In the portrait, Sarah is weaving a decorative fringe on a portable loom, which may symbolize the couple's endorsement of the colonists' boycott of English goods. Famous as one of Copley's finest works soon after it was painted, this portrait shows the artist at the height of his powers. Born in Boston in 1738 into a poor immigrant family, Copley was self-taught. He developed a highly finished style that rendered the features, costumes, and settings of his subjects with remarkable accuracy. Copley always kept a keen eye on his competition, and he may have been inspired to paint both Sarah and Thomas Mifflin on a single canvas by his contemporary Charles Willson Peale, who had recently completed a group portrait of the Philadelphia Cadwalader family that was admired for its portrayal of family unity and affection. Here, Copley depicts not only the features and costumes of his sitters with his famed skill, but creates an image of marriage as an affectionate, equal partnership--an innovative concept in American portraiture at the time. Famous as one of John Singleton Copley’s finest works immediately after it was painted, the portrait of Thomas and Sarah Mifflin—the first painting by Copley to enter the Museum’s collection—shows the artist at the height of his powers. Copley was a self-taught artist who developed a highly finished style that rendered the features, costumes, and surroundings of his subjects with remarkable accuracy. He was so popular in his native Boston that, unlike most colonial portraitists, Copley did not travel far seeking commissions. Thomas Mifflin and his wife, Sarah Morris Mifflin, the only Philadelphians to be painted by the artist, sat for their portrait in Boston in the summer of 1773. An ardent patriot and active participant in the Revolutionary movement, Mifflin rose to the rank of major general in the Continental Army and was elected the first governor of Pennsylvania after the colonies achieved independence. Sarah Morris, who married Mifflin in 1767, was an accomplished, witty, and supportive partner. In the portrait, Sarah’s handwork may symbolize the couple’s patriotic endorsement of the nonimportation agreements signed by American colonists resolved to boycott English goods. Portraits with more than one figure are rare in Copley’s work. However, he always kept a keen eye on his competition. He may have been inspired to paint the Mifflins together by his contemporary Charles Willson Peale, who recently had returned from art study in London with the newly fashionable idea of placing two or more figures together in informal poses. By showing both Sarah and Thomas Mifflin on a single canvas, Copley not only depicts the features and costumes of his sitters with his famed, painstaking skill (Sarah recalled that he required twenty sittings for the hands alone) but also creates an image of marriage as an affectionate, equal partnership—an innovative concept in American portraiture at the time. As a penetrating study of an undoubtedly happy union, it has few peers among paintings of any era. Darrel Sewell, from Philadelphia Museum of Art: Gifts in Honor of the 125th Anniversary (2002), p. 38. The Philadelphia merchant Thomas Mifflin, a firebrand of the American Revolution and later the first governor of Pennsylvania, convened in Boston in 1773 with like-minded rebels. While there, he and his wife, Sarah Morris, posed for Copley, the best painter in the colonies. Their radical politics may be subtly suggested by "Sally's" work on a portable loom, weaving her own decorative fringe to demonstrate support of a boycott of highly taxed imported English goods. Copley's masterpiece, immediately recognized as one of his finest and most complex portraits, captures the plain but elegant Quaker style of this young couple as well as the affectionate partnership of their marriage. Kathleen A. Foster, from Philadelphia Museum of Art: Handbook of the Collections, 2009.